NORFOLK, VA - The Norfolk Admirals have announced details for several promotions and ticket offers for this week's three-game home set with the Manchester Monarchs. The games will be played on Wednesday (Dec. 5), Friday (Dec. 7) and Saturday (Dec. 8) beginning at 7:00 p.m. at the Norfolk Scope. In honor of our 41st President George H. W. Bush (1924-2018), the Admirals are offering a special 41-percent discount on tickets for all active and retired military personnel with military ID. These discounted tickets must be purchased at the Scope Box Office. Each ID will be good for a discounted ticket for the ID holder and one guest. Offer Valid for Wednesday, December 5 game only. Fans are encouraged to bring a new teddy bear or stuffed animal to the game to throw out onto the ice when Admirals score their first goal. The Admirals will round-up all of the stuffed toys and distribute them to local children's charities for the holidays! 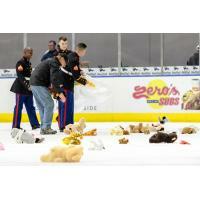 Watching the stuffed toys hit the ice is a sight to see and it's all for a great cause. so come join in on the fun!